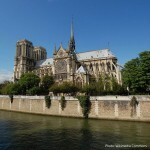 Notre Dame is one of the most recognizable examples of Gothic Architecture in France and in Europe. Its construction began in 1163 and lasted for two centuries. Maintenance, restoration work, and preservation have used Saint Astier® Natural Hydraulic Limes extensively, as do most French historical churches, basilicas, chapels and cathedrals.